Over recent years, an open plan office has been the default office layout that companies adopt, and with good reason. However, until recently, the negative impacts of the office structure have been unclear. Now, we need to seriously rethink how we design offices for the good of employees and of companies. The office layout has gone through numerous changes over the past century, as more and more companies have become office based and each trying to optimise performance. In the early 1900s, office structures were open spaces designed with a clear hierarchy in place. A manager or supervisor would spearhead the structure, often in a private office, facing staff with a watchful eye. This structure was commonplace for much of the 1900s until the 50s and 60s when socialist movements created change and constructed cubicle structures and divided work spaces – as we saw happen through the Mad Men TV show seasons. It wasn’t long before the office became a ‘cubicle farm’ – a structure many of us still work in today. But the vast majority, 80% in the US in fact, now work in open plan offices where there’s minimal or no division between banks of desks, and often no clear hierarchy. The open plan office does have its advantages because of its structure. Often, companies with this layout have a ‘flat structure’ and ‘open door policy’, which allows team members direct access to management. The lack of barriers also enables and facilitates conversation and engagement. In fact, 65% of employees see an increase in collaboration because of this. Additionally, and likely a prominent reason for why open plan offices have been so commonplace, is because they are often 20% more cost efficient to setup. This is a huge saving for new businesses, of which more than ever require office space to operate. However, open plan offices have some major drawbacks, some of which may shock businesses. Recent studies have highlighted that collaboration comes at a cost. Companies now know that they can expect a 15% hit on productivity because of the structure, and also see an increase in employee sick days by 62%. These are massive numbers, especially when fine margins can often make or break a company. Employees have also become more vocal in their dislike of the structure, particularly high performing staff who companies would be keen to appease. 54% of these team members reporting finding open plan structures too distracting, with an interruption occurring every 3 minutes on average. A change in office structure is clearly needed. With people spending an approximate 90,000 hours of their lives in an office, there’s no question that improvements need to be made, which can improve employee retention, especially of high performing staff. Of the alternatives on offer, it’s most likely that we’ll start to see a combination of changes. Remote working or working from closer-to-home coffee shops can have many life benefits for employees. Additionally, of all alternatives, the most positive changes can be had by adopting a biophillic approach – not only introducing nature into the office but incorporating it as a core part of the office structure. It’s no coincidence that 95% of people think of nature when asked to visualise something that makes them happy and companies see an increase in productivity and reduced absenteeism. 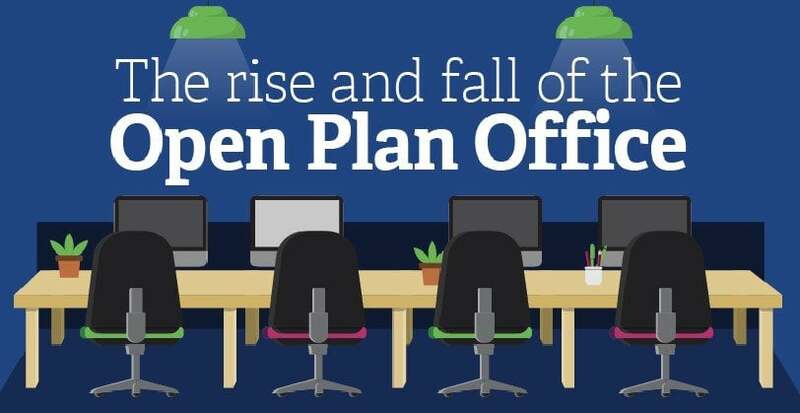 For more information, here’s a graphic by Sage ZA looking at the history of open plan offices, the most up-to-date research on them and what businesses alternatives are.